A new Dental Hygiene Alumni Wall at Missouri Southern State University honors graduates of the program and a longtime faculty member. The wall was dedicated on April 26 at the clinic, located in the Julio León Health Sciences building.Funding for the project was provided by Deanna and Ken Caviness as part of a gift from the Caviness Foundation in support of the MSSU Dental Hygiene program. Stacie Scrivner, chair of the dental hygiene department, says the wall includes alumni graduate class pictures from as far back as the 1970s and ‘80s all the way to recent years. 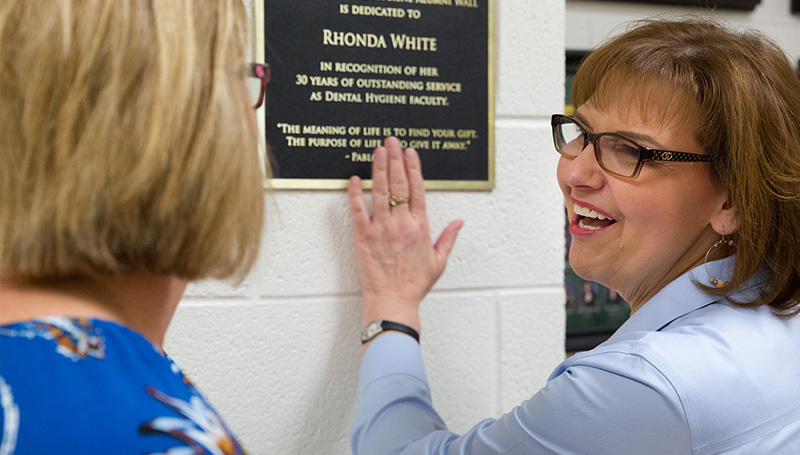 A special plaque was also dedicated recognizing faculty member Rhonda White for her 30 years of outstanding service as a dental hygiene instructor at MSSU.